One of women’s golf’s biggest stars, Grace Park, is hanging up her clubs after struggling with injuries. One of the biggest names in women’s golf has decided to put her clubs back in the bag – for good. Grace Park has won six career LPGA titles and collected one major – the 2004 Kraft Nabisco Championship – but won’t be able to make it a magnificent seventh. The 33-year-old South Korean told reporters that back, hip and neck injuries had taken a toll. She has won more than $5 million in prize money, but those injuries and two operations have seen her fade from the scene in recent years. Since 2005, she has made the final ten just once – a joint tenth spot at the 2010 Kraft Nabisco. There had been better news for Korean golf fans this weekend as the veteran Pak Se Ri took the lead at the halfway stage of the LPGA Championship, the second major of the season. She has won the event three times before (and has five majors in total), and at three-under with two rounds to go, looked in a good position to mount a serious challenge. But a disappointing 76 in the third round has seen her fall back. There’s still a round to go, but world number one Yani Tseng is out of the hunt after three disappointing rounds left her nine over par. It’s a far cry from last year, when Tseng finished 19-under to win the tournament by a massive ten shots. 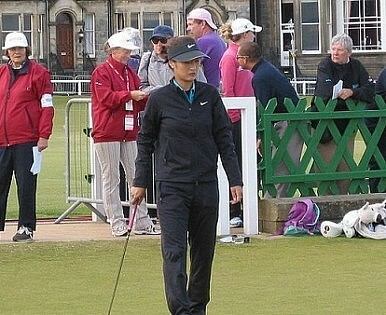 Michelle Wie was even worse. The star is in a serious slump and failed to make the cut for the fifth time in the last six starts. Her second round on Friday was a dismal 82. In the world of Asian golf, women dominate while men remain stunted by competing tours.